By harrisonca on August 18th, 2009 . Filed under: Cupcakes for a cause, Events, News . 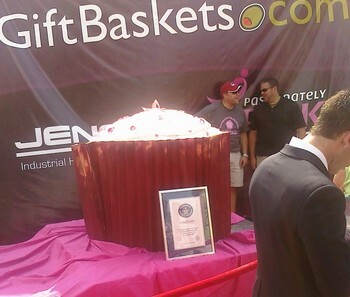 A couple weeks ago we reported rumors of a giant 7,000 lb cupcake being planned. 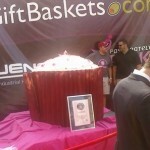 The initial plan was an unveiling event that included breaking the Guinness record as well as selling each 1 lb cupcake “slice” for $5 to benefit the Susan G. Komen for the Cure foundation. 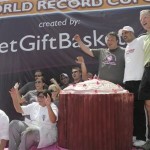 If successful, a single cupcake would net a cool $35,000 for charity! Instead of putting a 7,000 lb of cupcake batter inside an oven, an oven was constructed and hoisted on top of the batter. During an all-night baking process, the bakers were horrified to find that a heating element had dislodged in the middle of the night and had split the massive cupcake in half. 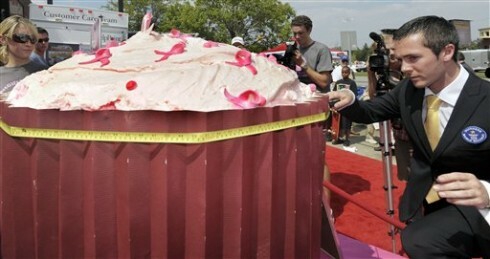 Scrambling to bake a new cupcake in time for the event, they rallied to make a smaller cupcake through the night. 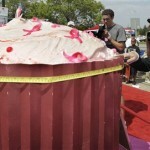 The new cupcake took 12 hours to fully bake and weighs in at a record setting 1,224 lb, still shattering the old record by a massive margin.